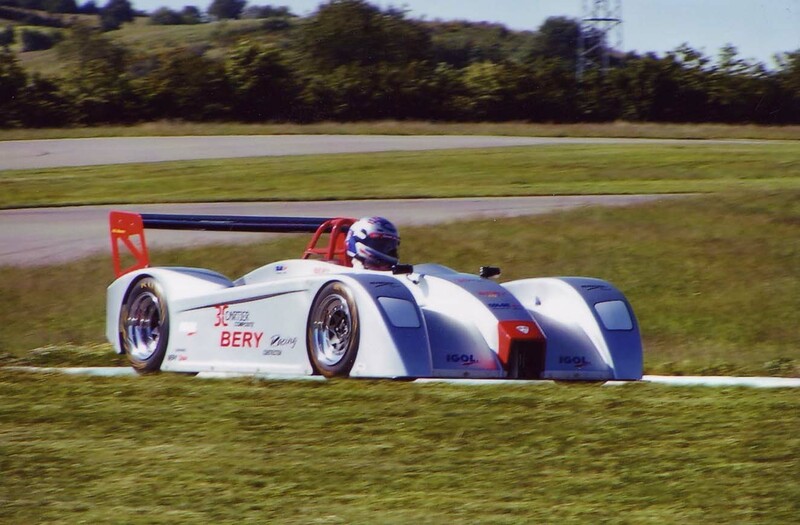 The Béry ES7 is a new motorcyle engined race car built by a former Ligier Formula One engineer, Mr. Alain Béry, in France. Inspired by the Audi R8, this lightweight sport racer uses a very clever aluminium monocoque chassis built using CAD designed aircraft spec. aluminum, bent, and bolted together elements, which are easy to replace for repair. "We are working on engine mount kits for the most popular engines, as well as exhaust headers and silencers for them. The test car (pictured at the right) uses a Yamaha R6 engine. The third car is being built, powered by a 2002 Suzuki GSXR 1000 FI engine." The car pictured on the right is chassis number 1. Mr Béry has already built 3 other cars; single seaters and a track day inline double seater to take friends around tracks. Some steel crossmembers are used for engine mount, hard points reinforcements, and the roll bar is bolted to the tub. can easily be built somewhat higher to accomodate the SCCA rules." The structure in front of pedals can be made in honeycomb to be used as a crash box. World championship with Hesketh’s Harvey Postlewaite designed car. At that time, the FIA decided that rubber was too cheap for the prestigious Formula 1, and included in the rules the obligation to use shocks and springs!!! If you look at today’s Formula 1 cars, their suspension hardly moves to maintain aerodynamic efficiency and it doesn’t make much sense!" The car uses 7" and 8" x 13" wheels fitted with Formula 3 tire sizes. The third car is being built with revised suspension pick up points to improve the geometry, a longer wheelbase, larger cockpit to allow for more healthy drivers, and some mods to simplify the fabrication and the mechanical access. Engine cooling is provided by large scoops on each side of cockpit, ducting to radiator with warm air going out the rear of the car. The front uses a flat bottom for the present, with only bodywork for downforce. An adjustable lip or a ground effect bottom is planned pending track results. The actual bottom is a wooden flat panel connected to an aluminium rear diffuser. The aero developement has only started and we may see some aerodynamic improvements coming. "This car was first designed for hobby and track day use in France. Since the local race regulations requiring an offset driver as Per FIA Group C regs, the Béry would not be allowed to race in France. This is the reason I proposed to try marketing the car in the US where the rules are different." changes to adapt easily. We are looking for a distributor in the US." our conditions to became an appointed distributor. In fact, what we need is a solid partnership with someone wishing to import, certify the car for your class(es), be able to support customers, and work together with us for improving the product based on racing experience. We do not have particular requirement, as far as quantities or minimal order, as we understand that such a product must be seen in action and hopefully winning before you can start selling successfully a certain number of cars." "This car is made to be fairly cheap to operate, to buy, and to repair while maintaining a good level of performances. Final price needs to be defined after clarifying the mods needed to be legal in the US, but shoud be close to $25,000 USD FOB factory in assembled condition. We are studying the possibility of selling kits, of different stages for DIY guys." *Quotes above are from Dan Terraz.